Getting your regular colon exam isn’t always popular. Endoscopes don’t come in comfortable sizes. In order to get a better (and less intimidating) view of your GI tract, Italian researchers at the CRIM Lab have developed a new version of a camera in a pill that you can swallow. Unlike previous camera pills, this one comes with remote controlled legs so that doctors can vary the rate at which it travels through you. The ‘spider pill’ has been tested in pigs with good results and could be wiggling its way down your intestines in the next year or two. Check out the BBC video of the device by clicking on the photo. Click to see the BBC News segment on CRIM Lab's new camera pill with legs. As Catherine Mohr mentioned in her discussion about robotic surgery, the future of medicine requires a better way of sensing what is happening in our bodies. 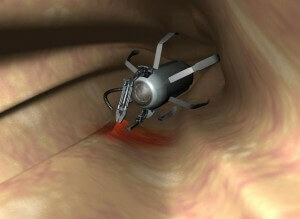 The spider-pill is a great upgrade for digestible cameras, using mechanical means to maneuver through your intestines. CRIM Lab, along with collaborators like the Vector Project, could develop pills that not only take pictures, but contain robotic instruments for surgery as well. Eventually, we may see nano-sized robots revolutionize medicine from the inside out. At 2.6 cubic centimeters, the spider pill isn’t exactly small, but it starts its journey by being swallowed. The pill is then remotely controlled by an RF signal that also transmits the video feed. By oscillating the legs in different patterns, the pill is slowly moved through the intestine or colon. When the legs are contracted and the pill powered off, the device flows with the natural order of things and is passed out of the body. Future versions of the pill could perform surgery. CRIM Lab is more about mechanical and robotic solutions than they are about medical expertise. In their recent article discussing the spider-pill in IOP, the biggest concerns were in regards to assembling the device, not its eventual medical uses. Still, given the number of ailments associated with the GI tract, and the difficulty in threading an endoscope from the bottom up, the spider pill should be able to save many lives and encourage men and women to be tested more regularly. Towards the end of the BBC video, we’re given a glimpse of another upgrade in camera pills: the submersible. While that device is pretty cool on its own, I’m more impressed with the trend we’re seeing. Right now we have spiders and subs, later we could have fully fledge robots. Maneuvering through the human body without seriously disturbing its processes will give doctors a better opportunity to detect illness and possibly prevent them. In a strange way, health care could start to mimic the There Was An Old Lady Who Swallowed a Fly folk song, but instead of progressively larger items, we could be digesting smaller and smaller ones. Hopefully that will reverse the outcome as well.